The following text and photos were borrowed from a Dutch website. 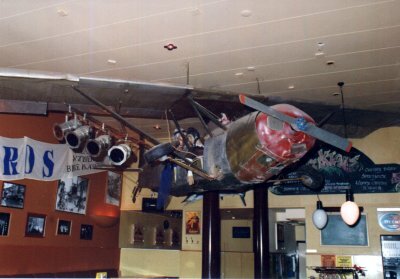 In Enschede (a small town in the Netherlands) there is a pub with an aircraft suspended from the ceiling. There are not many people who know what type of an aircraft is present in this pub. It is a Bakeng Duce, a what ? Yes a Bakeng Duce. We had to discover the type ourselves. The story goes back a few years. In october 1969 Jerry Bakeng designed a twoseated sportsplane and started the construction right away. After six months and $1500.-- it was ready for its first flight. This flight took place on april the 2nd 1970; the aircrafts registration was N70BD. he named the aircraft the "Duce" and it was a redesign of the Baby Ace. The aircraft was a success because of its performance and its was no wonder that the EEA gave the aircraft (and its designer) a few prices in 1971. The prototype (N70BD) is told to be still flying and is in the hands of a Ian Marnoch. 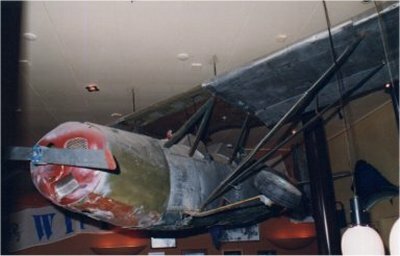 The success of the Duce stimulated Gerald (Jerry) Bakeng to design a biplane version of the Duce. This is why in 1972 the Bakeng Double Duce took to the air. Gerald Bakeng founded "Bakeng Aircraft" . Of both planes (mainly the Duce) hundred of drawingsets were sold to individuals all over the States. The aircraft was mainly built in the USA and building of the aircraft took approx. 1000hrs. The Duce was pretty popular and even a Bakeng Duce club was founded in the USA. The plane in Enchede NL is a Duce (N439BH) with s/n 385. The plane was built by Robert Hill from Kingsford Michigan USA. Hence the "BH" in N439BH. He started building the a/c in 1977 and took somewhat more time than 1000 hrs. It became a period of 10 years and the aircraft was finally finished in 1987. Bob Hill was a teacher at a local school at Kingsford and the aircraft was built at that location. Often parts of N439BH were used for instruction purposes and were taken of the aircraft to teach children. The complete landinggear of a Cessna 140 was used. Gerald Bakeng use the gear of a Cessna 190 ! The plane was checked in october 1980. Directly after the approval Hill was given permission to cover the aircraft with linnen. But Hill decided to use metal in stead of linnen and that took time. The aircraft gained weight due to that decision. The engine was a totally different problem. Bob Hill decided that the original engine did not meet his demands an he tried to find another powersource. Finally it received a Continental Ground Power Unit and was provided with a handmade wooden propellor. The engine was built in and in 1985 a run up was made and everything worked fine.As said the aircraft was finally ready in 1987. Sad enough the aircraft made a groundloop during a high speed taxi run. Within two months repairs were made and the aircraft was operational once again. About 1991 the plane was swappend for two cars, a boat and a 25hp boatengine. The new owner of the aircraft was a certain Peter Totsch who soled the aircraft to the Steele Magnet Company. Finally the aircraft became the property of Norman Automatics and via a deal with jukeboxes the aircraft ended up in the Netherlands. The purpose of the aircraft was to enlighten the interior of pubs and the like. The owner of Cafe Crash (Tom Mutter) bought the aircraft and it is now present at theat cafe in Enschede NL. The engine of the aircraft is not mounted but is also present in Enschede. This due to the weight of the engine; the propellor is mounted to the nose of the aircraft. To have a good look at the aircraft you only have to enter the bar and orde a beer!